Through his career, Boyd has gained significant courtroom experience as primary litigator in more than 50 jury trials. He is admitted to practice in West Virginia, having appeared in both the Northern and Southern Districts of West Virginia and the U.S. Court of Appeals for the Fourth Circuit. He is a member of the Fourth Circuit Judicial Conference. Before joining Warner Law Offices, Boyd served as a Member at Waters, Warner & Harris, PLLC in Clarksburg, where he focused his practice on personal injury, insurance, liabilities, oil and gas and other civil suits. Boyd graduated from West Virginia University with a bachelor’s degree in business and economics in 1962. As an undergraduate student, Boyd played tennis at WVU. He received his law degree from the West Virginia University College of Law and was admitted to the West Virginia Bar in 1965. While at the WVU College of Law, Boyd was a member of the Student Board of Editors for the West Virginia Law Review and an Associate Editor of the West Virginia Law Review. He is a member of the American Bar Association, West Virginia State Bar Association, Harrison County Bar Association, Defense Trial Counsel of West Virginia and the Defense Research Institute. Boyd has been inducted into the American College of Trial Lawyers, which is by invitation only, and just one percent of trial lawyers in the state may be inducted. 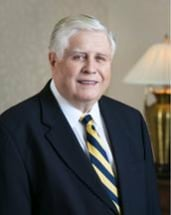 He is a past president of the Harrison County Bar Association and has been inducted as a Fellow to the West Virginia Bar Foundation. Boyd has been given an “AV” rating, the highest rating given to attorneys by Martindale-Hubbell. Boyd and his wife Jeannie live in Clarksburg. They have four children and 11 grandchildren. Boyd is an avid fly fisherman and bow hunter, and he enjoys spending time with his family. He is also a novelist, as the author of three books.